As mentioned below, I'm presently in the US. I've so far racked up about 100 species, all recorded within 50 miles of where I'm staying in North East Illinois (for the geographically challenged, that's just North of Chicago). The Autumn migration is just beginning, and this area is definitely a hotspot. I must say that the large array of Sparrow and Warbler species are a "challenge" to put it mildly, at least for somone unfamiliar with even the commonest of them, even though this is my fourth trip. The local hotline, run by the Illinois Ornithological Society, is a great source of timely information, even giving detailed information on the best places to park your car. Which brings me to another difference from much of my birding in Tasmania -- you can do a great deal of birding from the car. Nearly all the local reserves have paved roads running through them. However, on the other hand, in many reserves you have to stay on the walking tracks, no wandering off through the scrub--heavy fines ensue, and yes, your chances of being caught are quite high. Oh that we had a similar policing of our reserves around Hobart. Or, come to that, any policing at all! You might feel that you've stumbled upon the wrong blog! But your's truly is in the US on holiday, and another of my interests is aircraft. 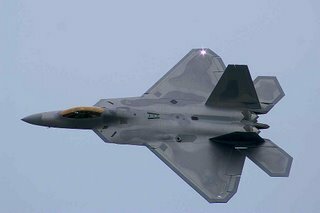 I have visited the Oshkosh Airshow in Wisconsin, probably the largest in the World. Certainly for numbers of visiting aircraft, reported to be 14,000, and that isn't a misprint. 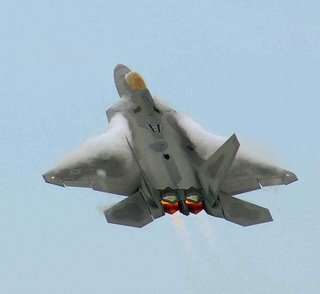 The highlight for many, was the appearance of the F-22 Raptor (pictured), only the 2nd public display. Despite temperatures in the near 40s C. and humidity around 80%+, I've still managed a fair bit of birding. 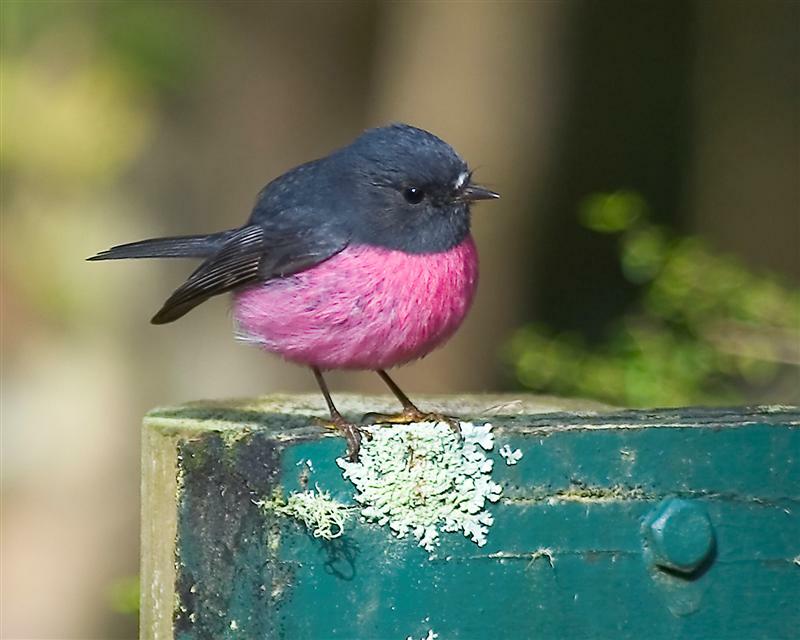 So, if you're interested, I suggest you visit Illinois Birds (there's a link at right). Highlight so far has probably been the Upland Sandpiper, but the rails have been a close second. 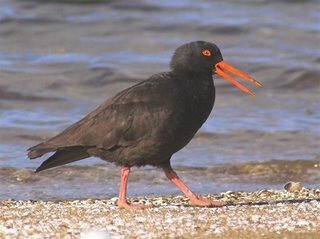 Hope to publish more Tasmanian birds soon, but using an unfamiliar computer has its drawbacks! I have been trying for sometime to get useable shots of the Yellow Wattlebird. On the face of it, it should have been easy as there are 5 pairs locally that I can find, without exception, at any time of the year. But YWBs spend much of their time high in a favoured eucalypt, frequently a Blue Gum (euc.globulus), their presence given away by their call. Although the literature suggests they roam widely during Winter, and many certainly do, the local pairs occupy and defend their territories throughout the year, maybe with less vigour during the non breeding season. On Bellerive Fort, the 19th century gun emplacement reserve, there are 2 resident pairs, which is where these shots were taken. 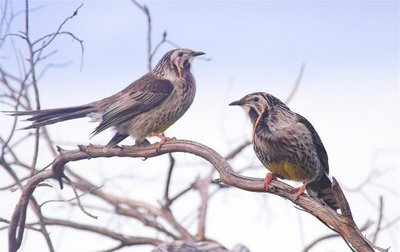 The Yellow Wattlebird is Australia's largest honeyeater, with the male reaching just short of half a metre in length and weighing up to 200 grammes, more than twice the weight of a Little Wattlebird. It is confined to Tasmania, and commonly seen in parks and gardens around Hobart. One fact, perhaps not so widely known, is that it was once considered a game bird. From the early colonial days, it was shot for the table, and a short season was opened each year, certainly upto the 1960s. It is now fully protected. The image at lower left, is a wattlebird in full voice, declaring to others of its species and perhaps to other honeyeaters, 'this site is occupied'. In doing this, it produces a sound variously described as "a cork pulled from a bottle" and " a person vomiting". It's certainly an unforgetable sound! The image at the top is, from my perspective, memorable. It's unusual to see both birds together--they usually feed well apart and communicate by call, and to get a shot of them together was extremely lucky. It has a somewhat 'surreal' look about it, but it hasn't been retouched. It's interesting to compare the 2 birds, with the smaller female on the left. 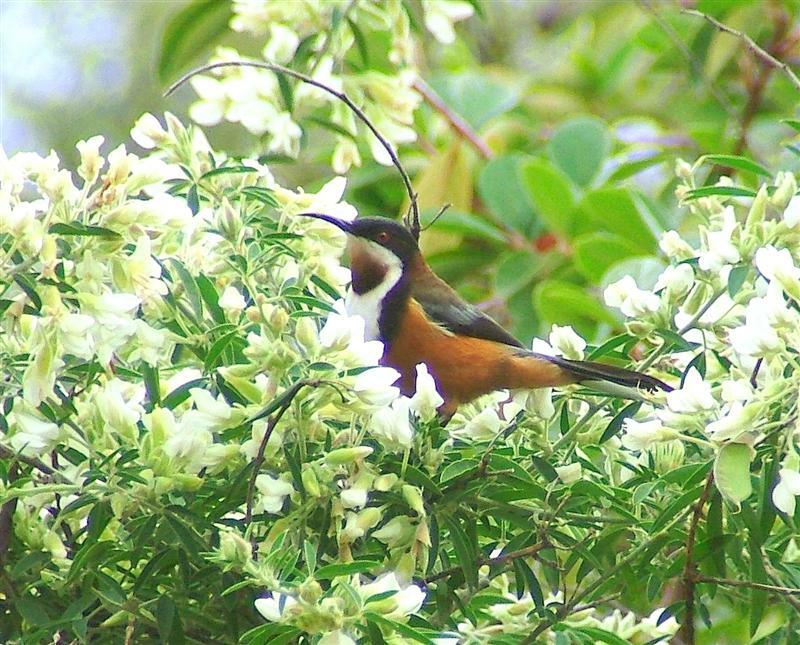 John Tongue continues his Spring theme: Another bird that that makes me think of Spring is the Eastern Spinebill. Even though it remains around all year, the clear, piping calls of this hansome fellow (reminiscent in some ways of the call of the White-throated Treecreeper on the Mainland, with it's incessant 'peep, peep, peep...') still makes me think of Spring. 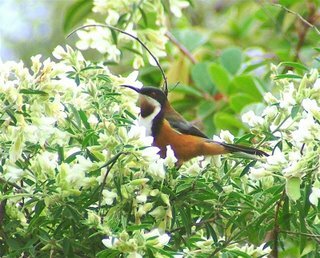 This chap was photographed in a flowering "Lucerne Tree" at my in-laws' place at Lindisfarne, a great spot for Spinebills and many other Honeyeaters. Calls are often a useful 'identifier', once you get fairly proficient at them. 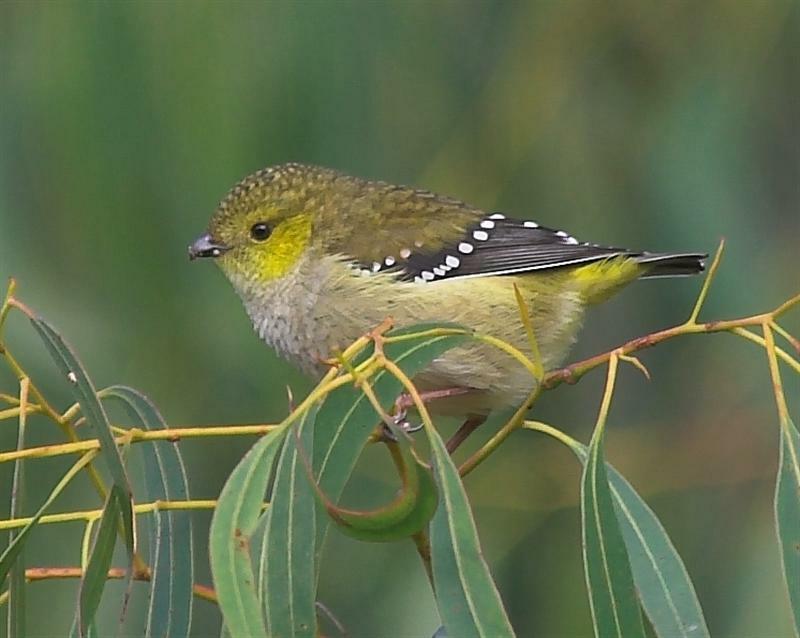 I shall be leading a "Birds Tasmania" outing in November, based around bird calls (not that I'm an expert!). Keep an eye out for details in the Birds-Tas Newsletter or the local newspaper. It's not always the big reserves which can give you a "photo op". As I returned from Clifton Beach the other morning, I decided to drive down Droughty Point Rd., in Rokeby, to check out and possibly photograph Kelp and Pacific Gulls in various plumages. I wasn't that hopeful of there being much there as the tide was fairly low. 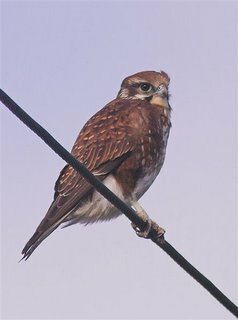 As I approached I stopped the car to 'shoot' yet another Brown Falcon, this one a male, hunting from a powerline (top left). Once at the reserve--it must be amongst the smallest, and very close to an industrial estate--I was able to park the car on the boat ramp. From there, without getting out of the car, I took the accompanying photos. 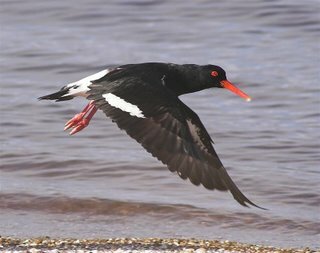 The Sooty Oystercatcher walked almost up to the car as it fed, while the rest of the flock of about a dozen, dozed nearby. However, their peace was shattered when 2 of them took part in an amazing game of chase across the bay. 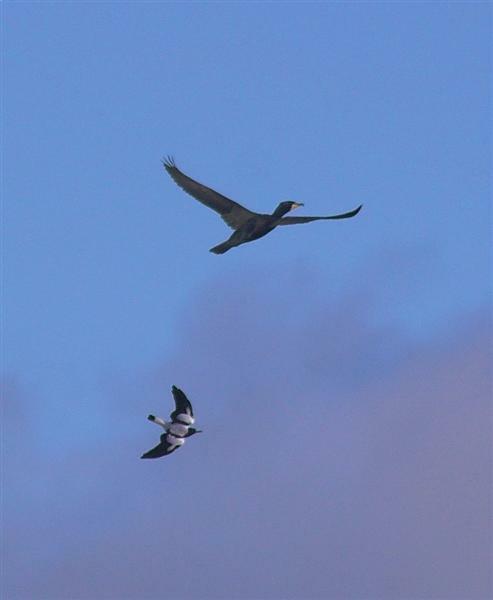 I assume this was a pair bonding flight as one pursued the other with great vigour. 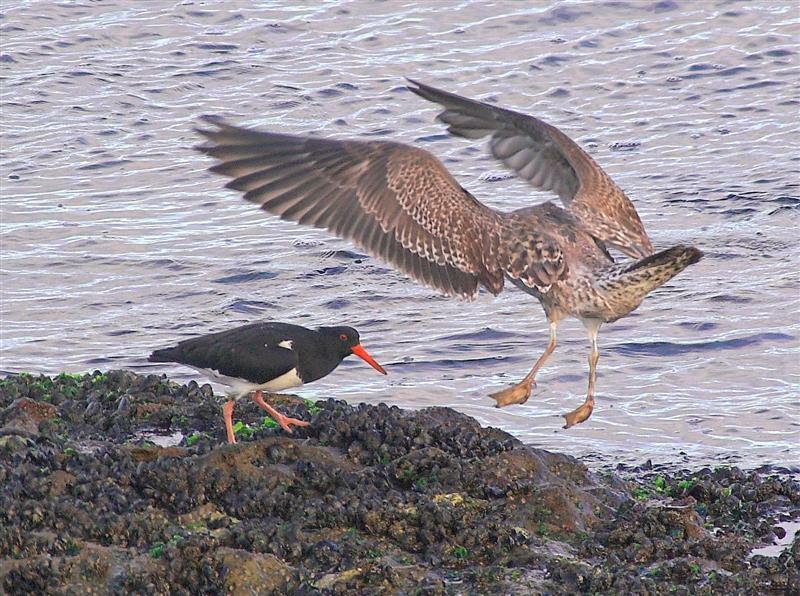 The Pied Oystercatcher pictured, one of about 10, is seen taking off, disturbed by the bye play of numerous Kelp Gulls. I took a number of shots of both Kelp and Pacific Gulls, but they will have to wait for another day. 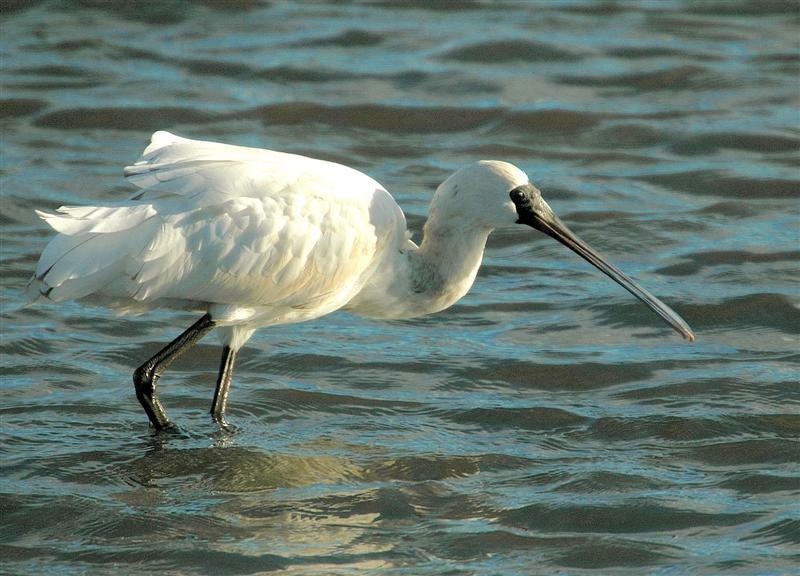 I thought they might be of interest, after reading a birding-aus e-mail on IDing gulls. Not so easy if you don't see them regularly. John Tongue contributed the following : After a couple of milder days, to be plunged today (11/7) back into the depths of Winter makes you long for Spring to roll around! The arrival of the migratory birds (some might soon start to arrive), and nesting, and so on, really makes it "Spring". 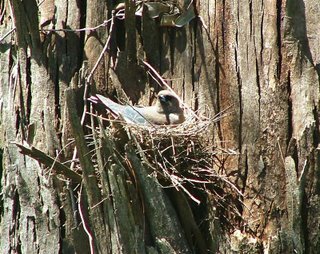 I took the shot of a Dusky Woodswallow nesting on Kingston Golf Course, last Spring. Beautifully camouflaged against the trunk of the tree, it was only that we stopped to look at some Black-headed Honeyeaters "dust bathing" nearby, that we noticed a Woodswallow seem to do a kamikaze dive straight into the tree trunk. When I went searching to see what it was doing, I found it sitting on its nest, pretending not to be there! The nest was concealed behind flaking bark, just about eye height from the ground--pretty low, I think, compared to where they usually seem to nest, and fairly vulnerable to predators, I would think. 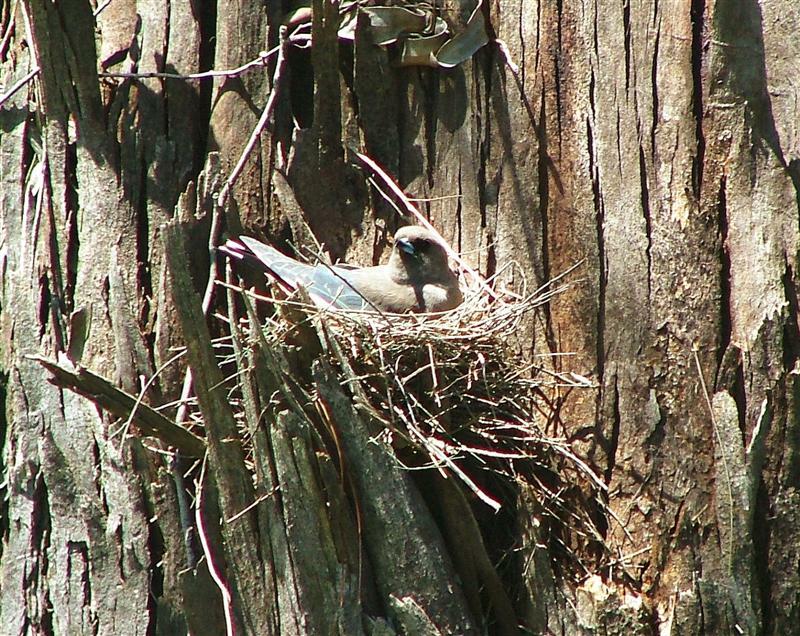 How does it compare to where others have found woodswallow nests? They are magnificently marked, and just seem to shout "Spring" and "New Life".....Or am I just wishing the weather would warm up? I have to admit feeling a little guilty about not often posting photos of Tasmanian endemics, after all the blog purports to be about Tasmanian birds! A recent e-mail from Denis Abbott mentioning his difficulties in trying to photograph the Fortyspots, prompted me to give it a go. So this morning I set off for The Peter Murrell Reserve at Kingston, early, but not too bright--the weather that is, not me! After a bit of a wander, I found several and tried my hand. Well Denis, I quickly understood your difficulties. They are very small and very active, and I don't recall having so many failures, but I persevered and the acco mpanying images are my first offering. Quite apart from the pardalotes, there was a lot of bird activity. 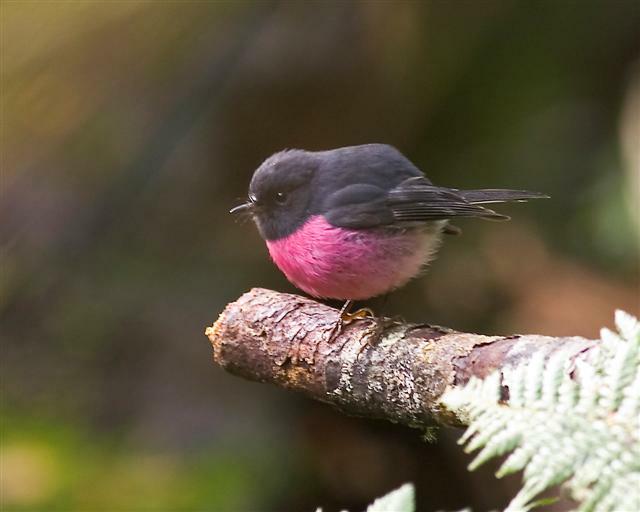 Other endemics were the ever present Tasmanian Nativehen, Black-headed and Yellow-throated Honeyeaters, Yellow Wattlebirds and Dusky Robins. A pair of Brown Falcons gave a spirited aerial display, and I heard a Golden Whistler calling persistently in the distance. I guess Spring is not too far off. This morning didn't look particularly promising, but I had made up my mind to visit the Wielangta Forest and duly went. I entered the area from the Copping end, which is not as well signposted as I think it should be. I say that because earlier in the week, I had turned off the Bream Creek Rd too soon and never did get to the forest. Well I have to blame someone, couldn't be my navigation. I stopped at a few vantage points to look out over Marion Bay, which had low cloud and probably rain over the sea and there was a stiff cool breeze blowing. It didn't exactly fire me with enthusiasm. I eventually stopped at the southern end of the Wielangta Rd forest walk. All rugged up, I walked about 40 metres from the car into the rainforest and propped near the creek. This proved to be as good a choice as I've recently made. From this spot, I watched Tasmanian Scrubwrens, joined briefly by two Scrubtits on the trunk of a eucalypt. A passing 'brown' Golden Whistler was followed closely by a male Pink Robin. This robin, stayed in the general area for the next hour as I tried valiantly to photograph it. The light in this rainforest area was extremely low and I ended up with a lot of poor shots, but I've posted a couple of them anyway. 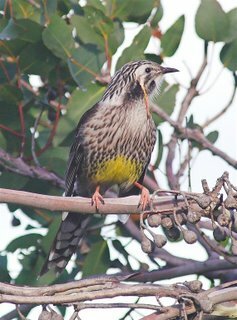 A small flock of Tasmanian Thornbills also passed through, gleaning food off the leaves, mostly hovering to do so. 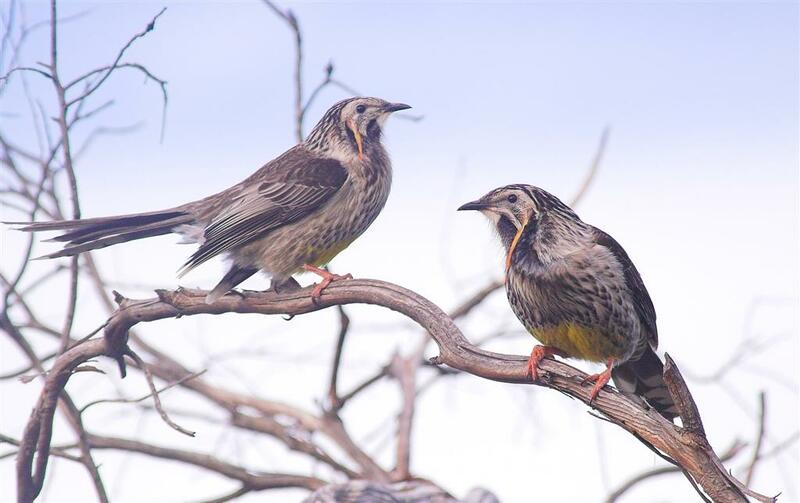 A flock of Strong-billed Honeyeaters flitted noisily past, high overhead. 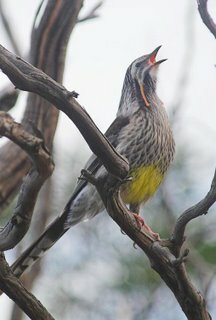 These were followed at intervals by Green Rosellas, Yellow Wattlebirds, Black Currawongs and a solitary Yellow-throated Honeyeater. A family group of Superb-fairy Wrens, the inevitable Forest Ravens and numerous Crescent Honeyeaters were also seen. 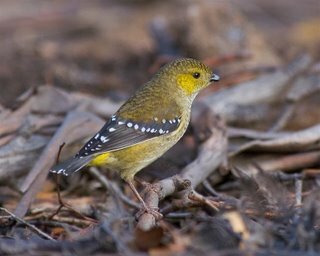 I later, briefly, visited the Northern end of this walk and found Tasmanian Thornbills, Tasmanian Scrubwrens, Scrubtits and Pink Robins there too. So if your looking for a different venue to see these, mostly endemic species, you might consider visiting the Wielangta Forest. A very satisfactory morning. 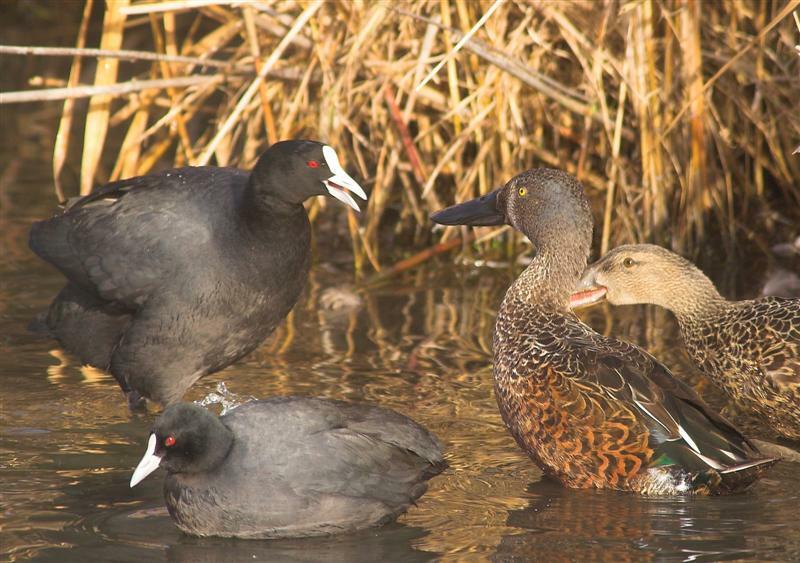 I'm sure while birding, most of us come across confrontations between birds. 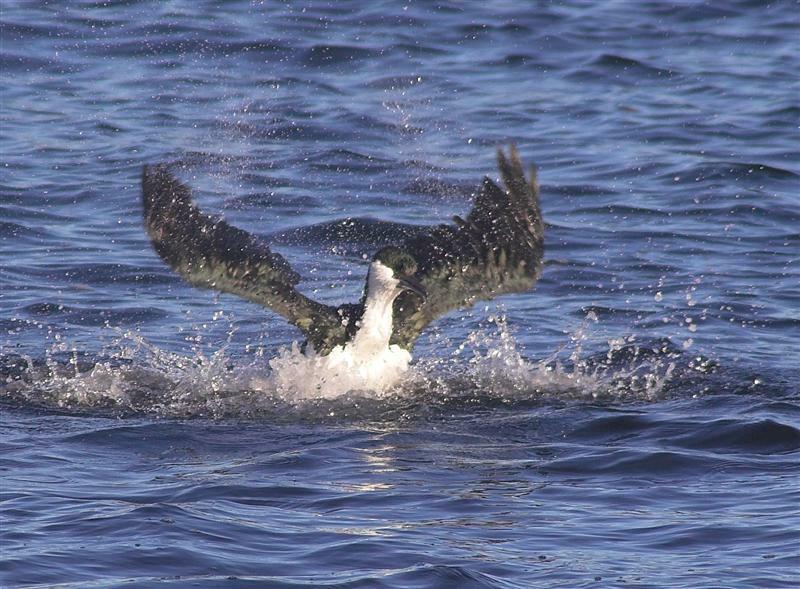 Out of the breeding season, they most often include predators of one sort or another, but this is certainly not always the case. During the last few weeks, I've photographed a few confrontations between less likely combatants, some I've posted here. The first one involves a dispute over the use of a raised spot at Gould's Lagoon, between a Coot and a pair of Australasian Shoveller. The Coot backed down, allowing the Shovellers to stand and preen atop this small 'island'. of room for both birds, the Oystercatcher was not happy before it had moved the Gull completely clear of the rock. The third one was between two species that generally don't come into much contact with one another, an Australian Magpie and a Great Cormorant. The Magpie had tolerated the Cormorant all the time that it was roosting, but the moment it took flight it harassed it as only Magpies can. I can't help feeling the above mirrors the state of the World just at this time! I rarely get close enough to Black-fronted Plovers to photograph them, but this morning I finally did, just! I dropped in to (not literally) the Lewisham "duck pond", which has a pretty low water level at the moment and fewer waterfowl than usual, and noted 2 Blackfronts feeding at the Northern (shallow) end. That at least meant that with luck I might be able to photograph them from the car. I waited sometime as they gradually moved toward me, feeding in the liquified mud, as they did so. While watching them closely, I realised they were using the 'foot trembling' technique. This is the first time that I can recall observing this method of feeding by Blackfronts, but I can't remember seeing them feeding in liquified mud before either! 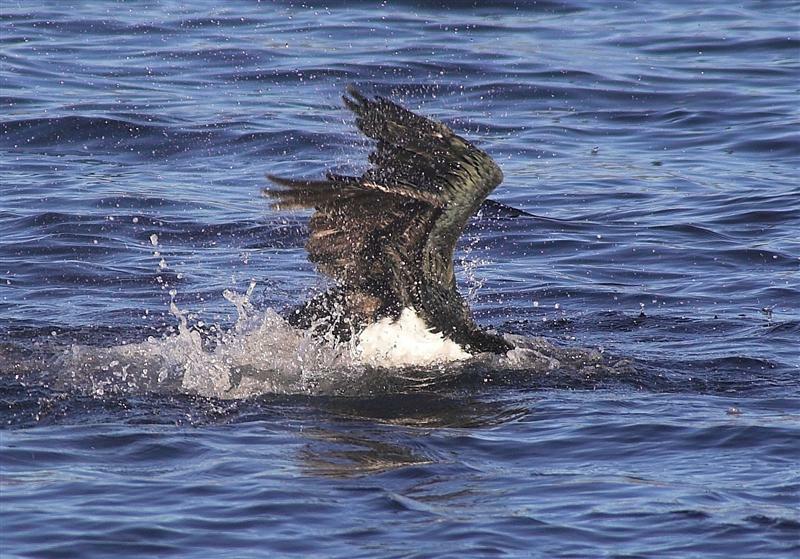 The technique consists of the bird putting one foot forward in mud/water and moving the foot rapidly from side to side--trembling--which presumably disturbs the prey, followed by a quick dart forward to seize it. It's a method that Silver Gulls often employ. 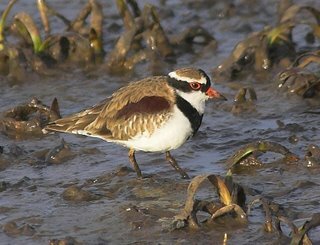 Black-fronted Plovers appear to have increased in numbers over the past 30 years, probably as a result of many more farm dams being built. This venue at Lewisham generally holds a few birds. 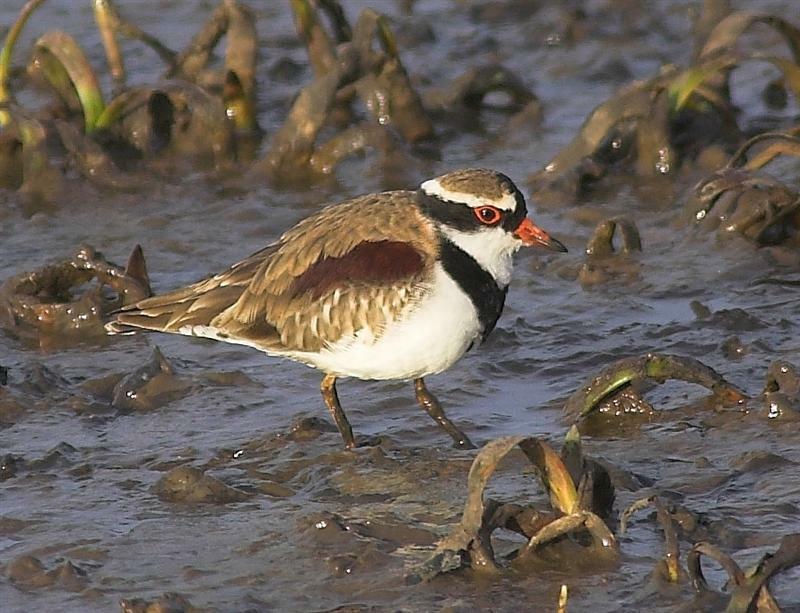 Geoff Rakers contributed this recent sighting and photos: While travelling along Shark Point Rd., I noticed a group of birds on the Northern riverbank, near the large inlet bridge to Orielton Lagoon. 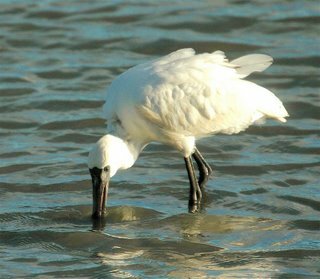 A Royal Spoonbill was preening itself, closely and apparently warily scrutinised by three White-faced Heron "attendants". Not long after, the Spoonbill entered the river and began sifting in the shallows. The herons mysteriously dispersed. I wa s able to photograph the feeding bird from the bridge and thought; "What a coincidence! Viewing a 'Royal' on the Queen's Birthday holiday. 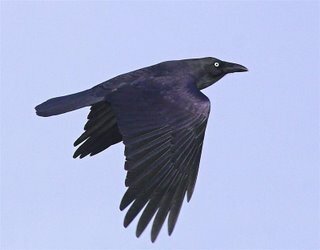 As a few may remember, I have been trying to get better shots of Forest Ravens, and today, in two different venues, I managed to make some improvement. While processing the shots, I realised that far from being black, seen in the right light, they're a rather nice, shiny, dark royal blue. 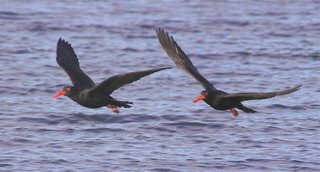 For some time I believed, wrongly, that they were a Tasmanian endemic, perhaps the latin name corvus tasmanicus suggested that. 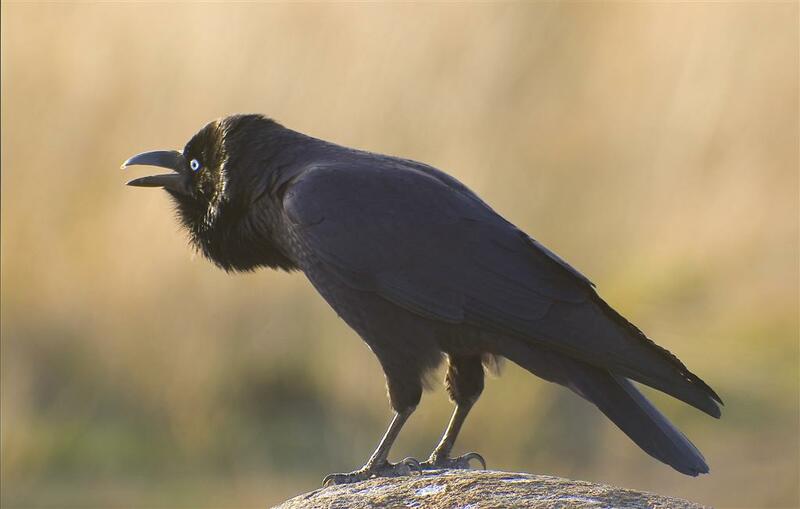 I can recall photographing a very co-operative 'crow' on Wilson's Promontory some years back. It looked all too familiar and it was! Other populations are found in The Otways and North Eastern NSW. If it's as successful on the Mainland as here in Tasmania, the population could be expected to expand. Forest Ravens can be found virtually anywhere in the state. Their ID is made easier by being the only 'crow' found throughout Tasmania, with the exception of King Island, which they share there with the commoner Little Raven. I assume, the bird at top, is making a territorial statement, or perhaps advertising for a mate, as it appeared to be alone. 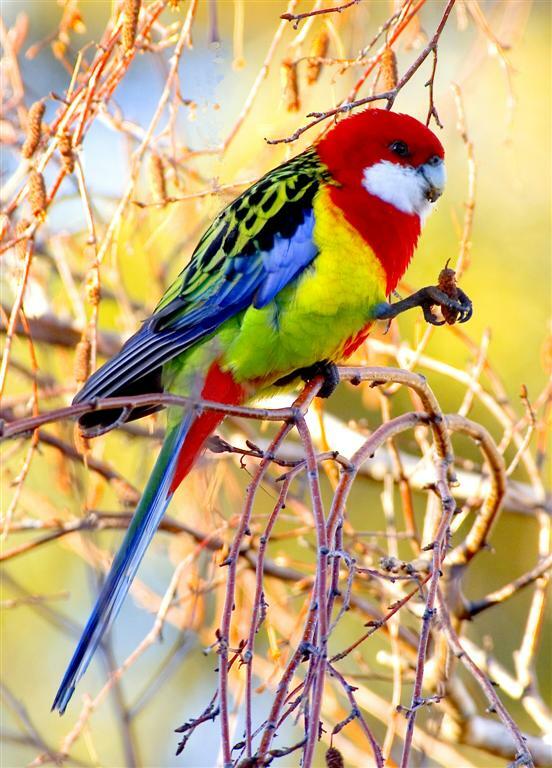 It was photographed at the lookout on top of Rosny Hill, in the late afternoon sun. I must say that I am apt to jump to conclusions, frequently the wrong ones, and this morning's episode was no exception! 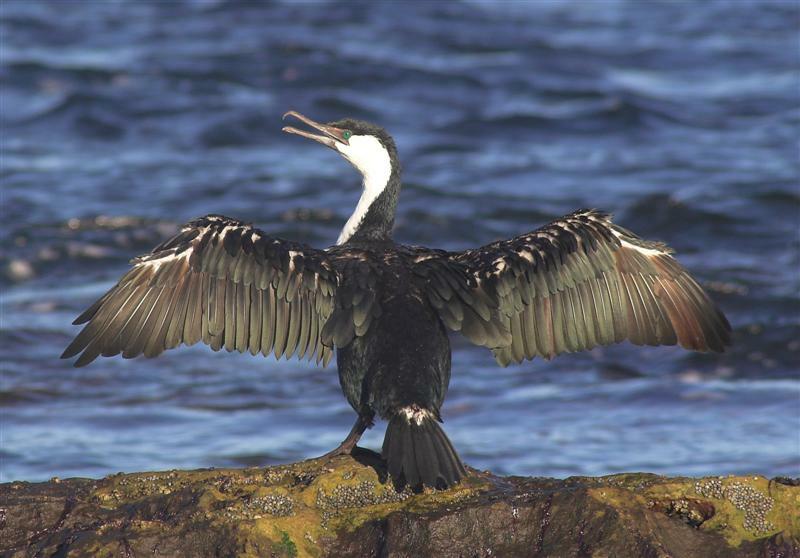 I often watch the Black-faced Cormorants fishing off the nearby rocks in the Derwent River and I'm firmly of the believe that the increased numbers around here are the direct result of the banning of fish netting in the Derwent. 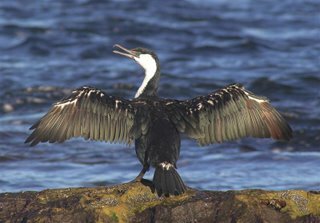 I know that Cormorants and Little Penguins were often a bye catch of netting, and the lack of netting should have increased the food available. But, I digress. This morning I watched the antics of a Black-faced shown in the images at left. I convinced myself that I was photographing this bird using a fishing technique I had not previously observed. For several minutes it repeatedly splashed on the surface, followed each time by a shallow dive, kicking up a spray of water, zig zagging as it went and all the time getting closer to the rocks. I thought that this was a method of driving fish towards the rocks, and I was fortunate to be recording it. The truth, I'm disappointed to say, was rather more mundane. 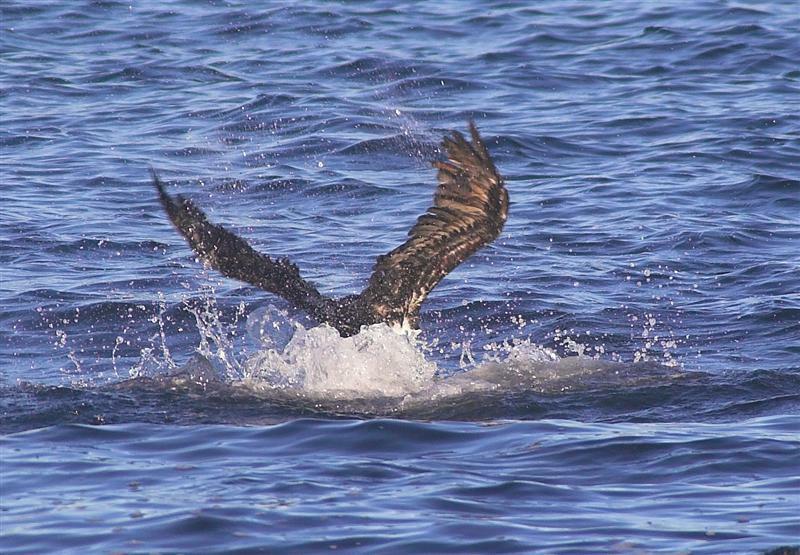 This bird was actually only having a good wash before retiring to the rocks to dry. You may scoff, but in my defence, I can only say that this was the first time I had witnessed this behaviour and I'm a little wiser! I hope at least the pi ctures are interesting.